Cocooned amongst natural bushland and a freshwater lagoon, RACV Noosa Resort is your ideal Sunshine Coast holiday haven! Experience happiness for everyone at this stunning resort—there are activities for those who love to be super active, plus ample opportunities for those who just want to lie back and relax. With the flexibility to dine in or out and beautifully appointed 1, 2 or 3-bedroom apartments, this the ideal place for a family adventure or a fabulous getaway with friends! 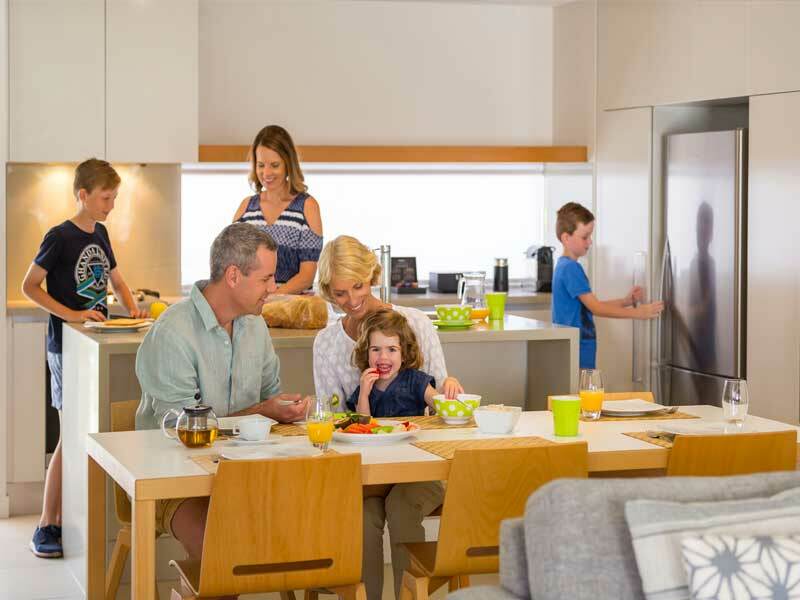 RACV Noosa Resort has that 5-star holiday village feeling that you wish you could bottle up and take home. 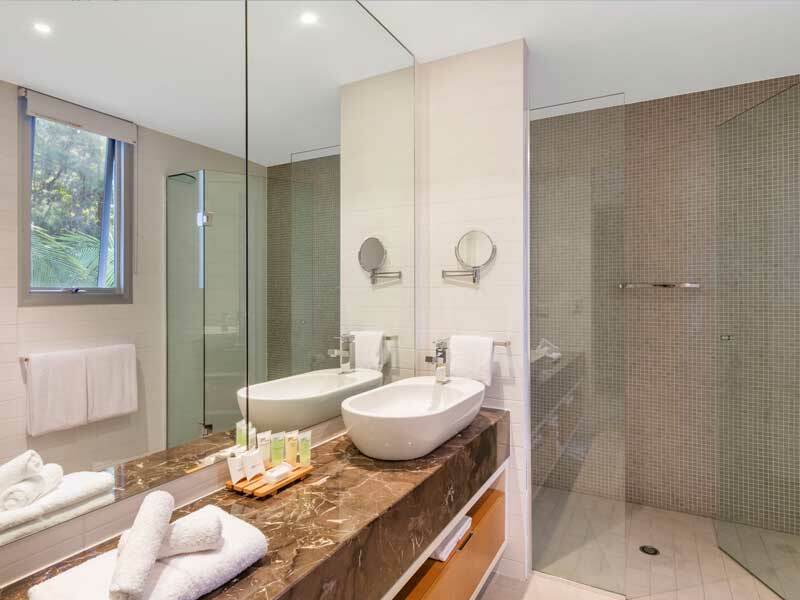 Cradled between the lush greenery of the Noosa Sanctuary bushlands and a relaxing freshwater lagoon, RACV Noosa Resort offers spacious and modern 1, 2 or 3-bedroom apartments perfectly laid out on well maintained and beautifully landscaped grounds. Stroll into the sandy-edge lagoon pool and watch the kids have the time of their lives on the two water slides and splash fun park. When hunger strikes, enjoy woodfired pizzas and refreshing cocktails poolside. If you’re keen to get out and about, getting to and from Hastings Street and Noosa Main Beach has never been easier. RACV Noosa Resort offers a complimentary resort shuttle which runs hourly throughout the day. 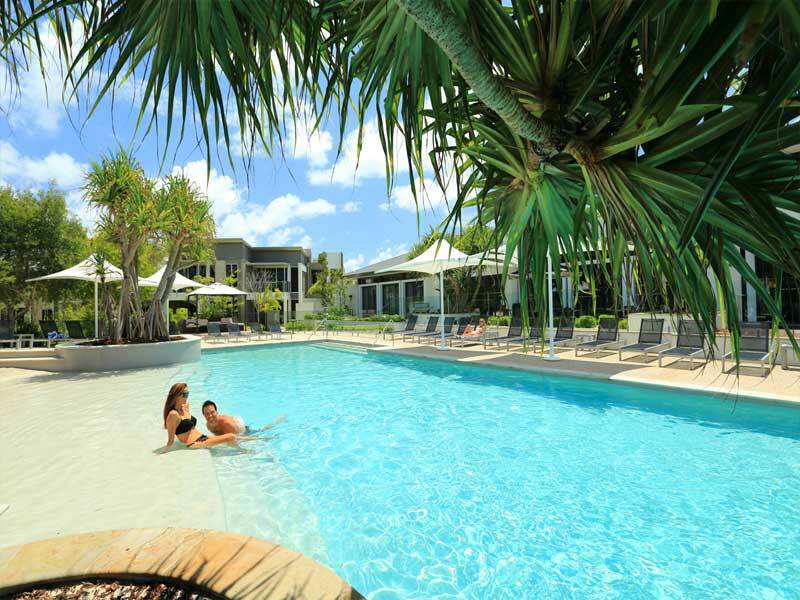 At RACV Noosa Resort you will forget what day it is as you transport yourself to the carefree days of holiday-mode. Soak up the sunshine and breathe in the fresh air as you relax into each day. Choose between fun filled days of swimming, ping pong, air hockey, tennis, bike rides and bush walks or, alternatively, lounge in the beach before indulging in spa treatments at RACV’s signature One Spa! Onsite dining is available at Arcuri Restaurant and delicious drinks can be purchased from Dazza’s Bar. If the urge to reconnect with the outside world does occur, you can do so with the complimentary Wi-Fi. This is available to all guests, plus each of the guestrooms also feature flat screen TVs with a multitude of satellite channels. 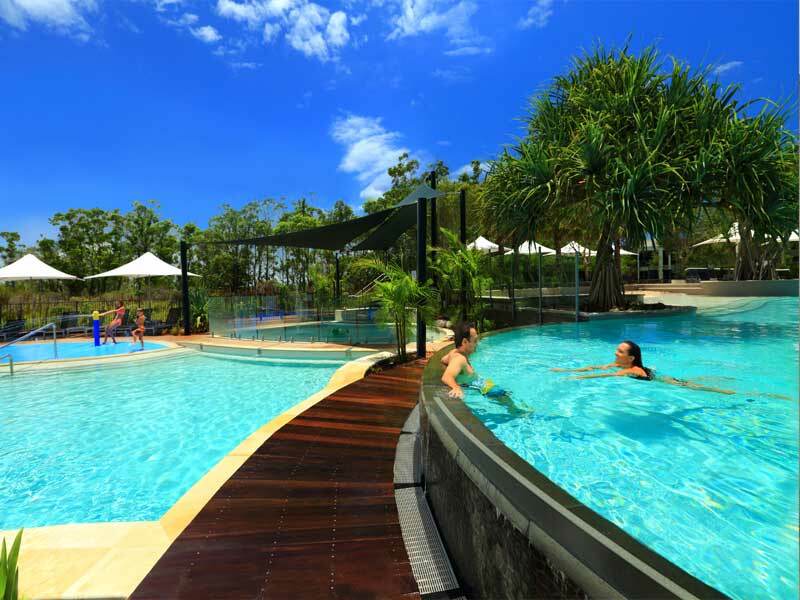 Why go to RACV Noosa Resort? Noosa is one of those unique destinations that attracts visitors back year after year. There is so much to see and do that one visit is never enough! 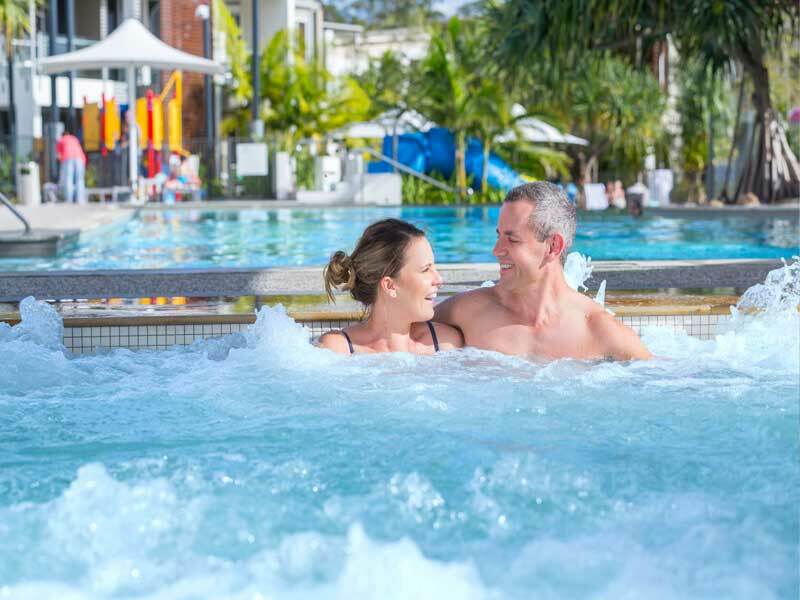 RACV Noosa Resort offers the ideal setting from which to base your exploration of this wonderful corner of the world. 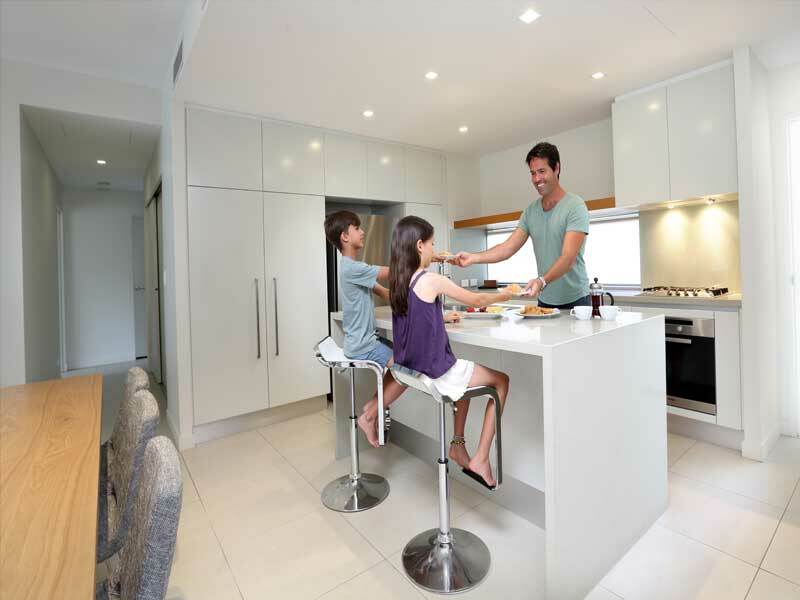 Most of the apartments feature kitchen facilities, plus there’s the added convenience of dining at Arcuri Restaurant. Even the winter months are a great time to visit with the inviting swimming pools and a jacuzzi heated to the to just the right temperature! Overlooking the lush greenery of the Noosa Sanctuary Bushlands, 1 Bedroom Sanctuary Apartments are available on the first or ground floor. Each boast a private balcony opening up of the living room and a kitchenette with microwave, mini fridge and Nespresso coffee machine. 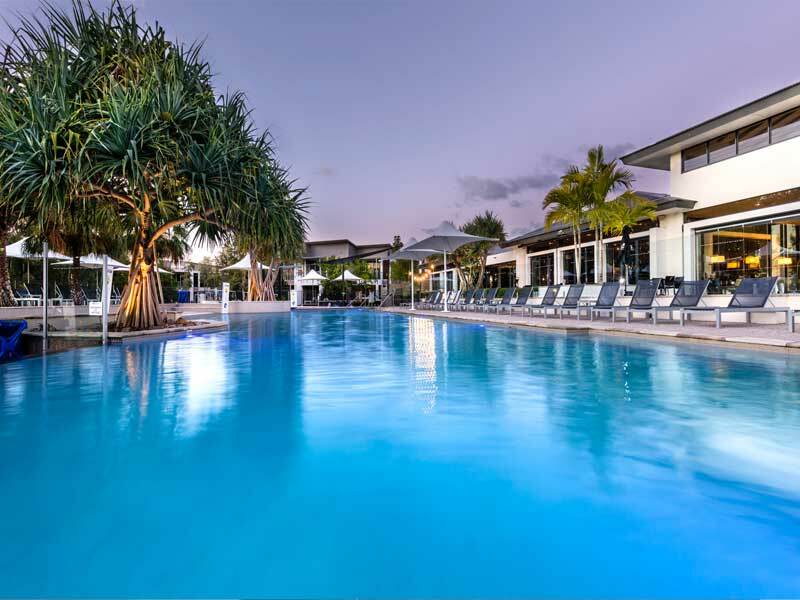 Other features include a washer/dryer combo, air-conditioning, Wi-Fi access and flat screen TV’s in both the bedroom and living room—1 Bedroom Sanctuary Apartments have everything you could possibly need for a fantastic Sunshine Coast holiday! Serviced daily and coming in at 57sq. metres, these apartments offer a choice of 1 King Bed or 2 Single Beds. They can sleep up to 2 guests. Wake up to the sun glistening through the trees of the Noosa Sanctuary Bushland, slip on your fluffy robe and walk straight out onto your balcony that extends off the master bedroom. With an absolutely decadent amount of space (121sq. metres! ), 2 Bedroom Sanctuary Apartments have the added convenience of two bathrooms—an en-suite off the master bedroom and a main bathroom with a shower and a bathtub. Other apartment features include a fully equipped kitchen, laundry facilities, open plan living space, Wi-Fi to keep you connected and air-conditioning to keep you cool. Serviced weekly, 2 Bedroom Sanctuary Apartments feature 2 King Beds or 4 Single Beds and can sleep up to 5 guests. Listen to the breeze rustling through the trees, watch the birds as they dip in and out amongst the branches, and bask in the serenity of your private balcony off the master bedroom. 3 Bedroom Sanctuary Apartments are super spacious (200sq. metres) and have it all. They offer 2 balconies, separate open plan living areas, a fully equipped kitchen, laundry with washer/dryer, weekly servicing, Wi-Fi access to keep you connected, air-conditioning to keep you cool and the convenience of three bathrooms (two en-suites with showers and a main bathroom with a shower and a bathtub!). Ideal for groups of friends or families, these apartments feature 3 separate bedrooms. This includes a master bedroom with 1 King Bed and two other rooms with a choice of 1 King Bed or 2 Single Beds. Perfect for big families or larger groups, 3 Bedroom Sanctuary Apartments can sleep up to 7 guests! RACV Noosa Resort is nestled between natural bushland and a stunning lagoon—in a realm of their own, out of the way of the crowds! 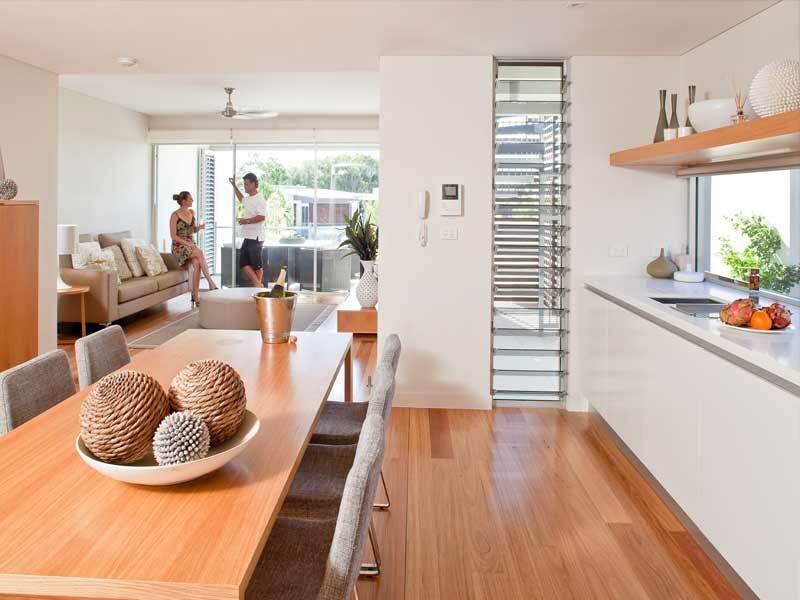 Noosa’s beautiful white sandy beaches, national parks, cinemas, shopping, dining and riverside parklands all nearby too. Enjoy this stunning resort year-round and get in and out with ease—the Sunshine Coast Airport is only a half hour drive from the resort! 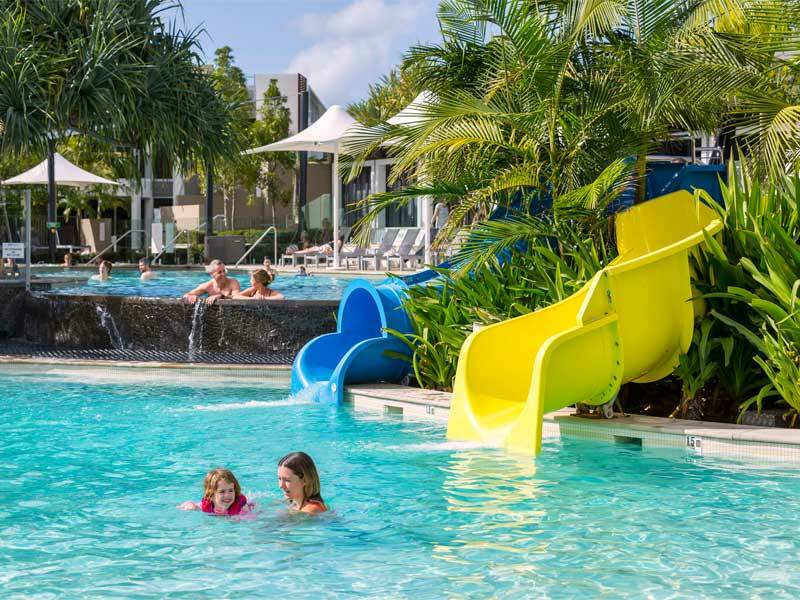 Enjoy water activities at anytime of the year at RACV Noosa Resort. All of the pools at this resort are heated in the cool months so you can splash, dip and play even in the cooler months! 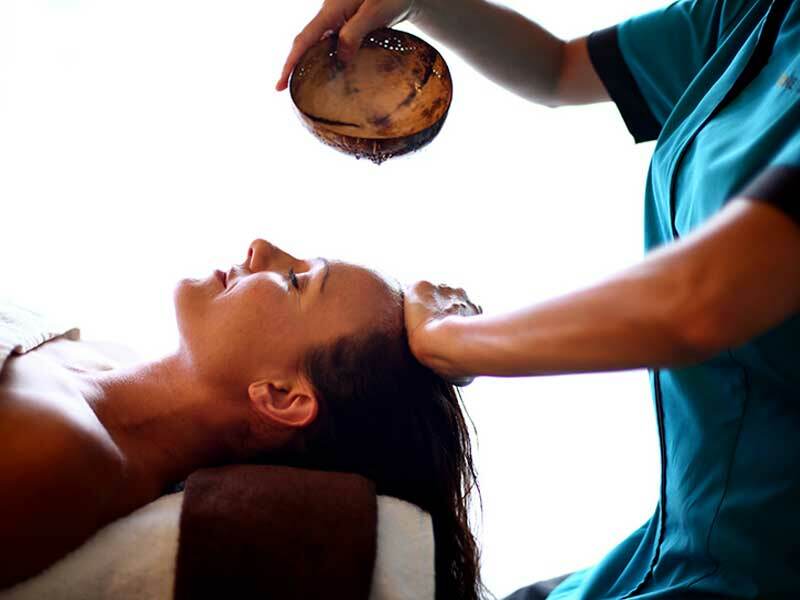 Unwind at RACV’s signature day spa, One Spa. 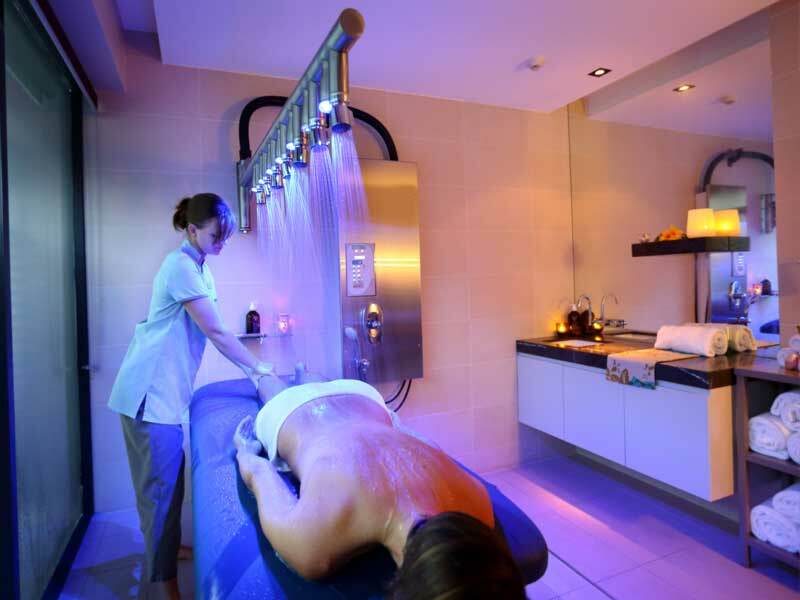 Rejuvenate your skin with a body wrap and soak tired muscles in the hydrotherapy bath. 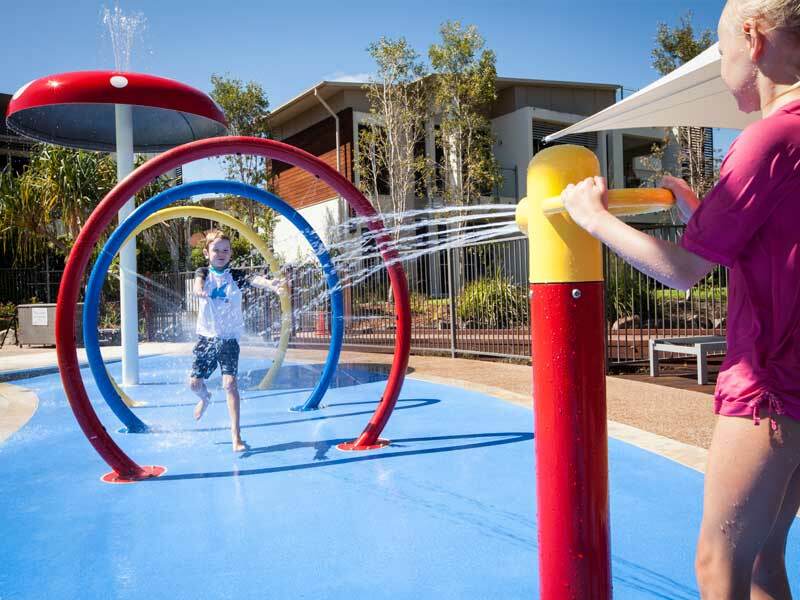 Kids will love the water slides, air hockey, ping pong and the floodlit tennis courts and guests can bring their own bikes or hire them onsite and make use of the excellent flat paths that weave amongst parkland along the Weyba Lagoons and the Noosa River. Hop on the complimentary shuttle and save yourself the stress of parking, if you want to explore nearby Hastings Street. You can also access Noosa Main Beach just 2 kilometres from RACV Noosa Resort using the shuttle. This beach is one of the few beaches in Australia that faces north and is situated in the beautiful Laguna Bay, with calmer conditions and smaller waves, making this beach perfect for children and those who would like to learn how to surf. Stroll along the famous Hastings Street, running parallel to the beach, filled with restaurants, ice cream parlours, boutique stores and luxury residences. Get the blood pumping with a hike in the Noosa National Park or make the day of it with a picnic! We stayed for 10 nights at the RACV Noosa Resort and loved every minute of it. The staff are great and so friendly, the food is amazing (every time), the pool area is fantastic, our kids absolutely loved it—so did we! All the facilities at the resort just make your stay really special and comfortable. We stayed in the 3-bedroom villa, so clean and with a sense of detail to appliances that truly made it feel like a home away from home.